Ally Kirkpatrick started working with Rupp Fitness the summer before her freshman year in high school. Her focus: training to enhance her game in soccer. Her result: impressive. As a forward, Ally's honors include starting varsity her freshman through senior years. She was named captain her senior year (2013-14). She made the All-Central and All-Delco teams in her junior and senior years. 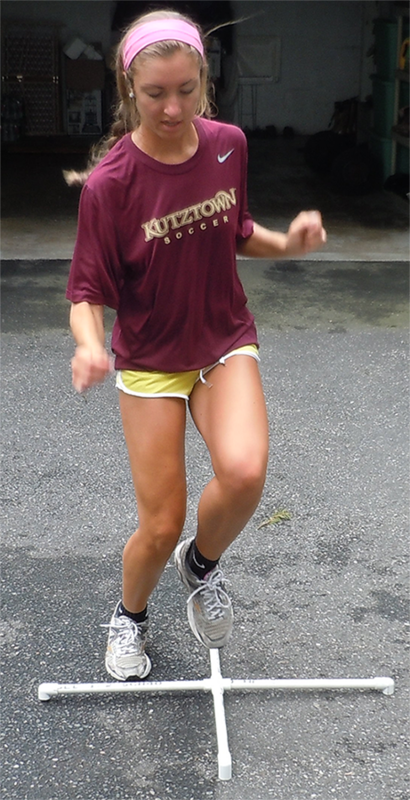 Now Ally is working with Rupp Fitness in preparation for her freshman soccer season at Kutztown University. Ally's workouts include a variety of exercises, some sports-specific, others to build strength, speed, and stamina. At top left, she works a 4-square agility drill; below she does power cleans to a push press.